The yamabushi were originally mountain hermits, ascetics, healers, warriors and holy people who followed the extremely demanding path of shugendo. The people who followed this path came to be known by a variety of names, some of which include kenja, Yamahoshi and shugenja. The yamabushi came to be known for their magical abilities and occult knowledge and were sought out as healers or wizards. However as well as their affinity with nature and their religious studies they were also well versed in a variety of martial arts – improving their physical, mental and spiritual well being. The yamabushi therefore became known as great warriors, as well as monks. Just like other warrior monks, the Yamabushi used a variety of weaponry and it’s not uncommon to find references to them fighting with such. Traditionally the yamabushi weapon of choice was the naginata (Halberd). Today, the Yamabushi continue to serve humanity just as they have done in the past. No longer through dying in battle, but by living in peace and providing help, guidance, and support to anyone seeking or requiring these. 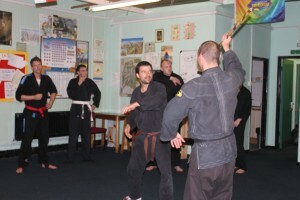 Yamabushi provide training in both the historical aspects of the traditional martial arts and philosophies and contemporary aspects such as self-defence and personal safety. Yamabushi also maintain strong links with the Institute of Martial Arts and Sciences, an official academic and educational body listed in British Qualifications and and offering CPD/Academic courses through its partnership with several universities. In addition,both Yamabushi Ryu and its wider multi – style associated organisation the Shugenja Kokusai Bujutsu Renmei are members of the Kodo Butoku Renmei (old ways martial arts federation). We also maintain official links with the Yambushi in Japan. We are a very “Pro-Active” association, and there is nearly always something of interest going on such as international seminars, national courses or lively social events.. Education, qualifications, spiritual quests, fitness, confidence, its all here waiting for you at one of our friendly nearby clubs.